The Buzz: Happy Birthday, Melissa! Hello Friends! Today is a special day, because it's Melissa ( MelJen's) Birthday! I've created a card just for her and I hope it's arrived at her home by the time this posts! I am blessed to be part of the MelJen's Design Team. I love Melissa's whimsical images and it is a joy and a pleasure for me to bring them to life with my own creative twist and to share them with all of you. If you are a fan of MelJen's Designs, you can view all of the projects I've created by clicking HERE or by following my MelJen's Gallery on Pinterest. It's no secret that I love Melissa's cupcake images. 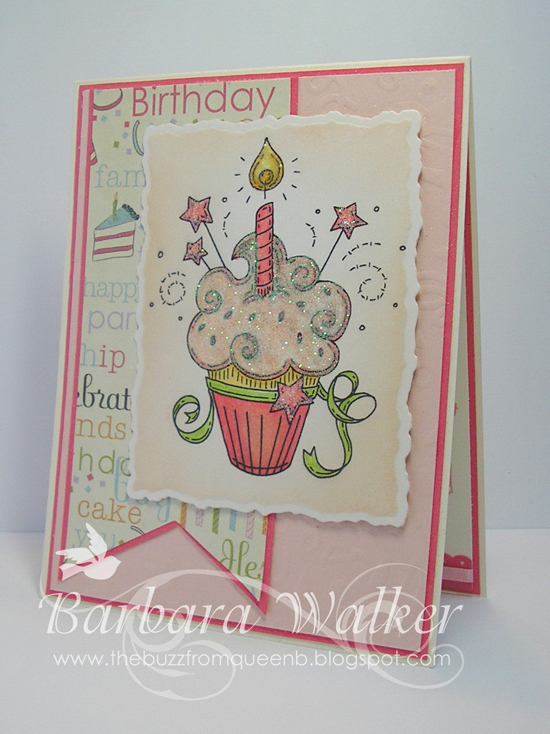 I've used them several times, click HERE to view my collection of cupcake cards. So, it's only fitting that I would use Birthday Cupcake to create a card for her. And I used lots of pink on this one, since that is her favorite color. Fun image, right? It's printed on my favorite iridescent card stock, colored with Copics and die cut. I dusted on a little ink, while the image was still in the die. This is one sparkly cupcake! I added lots of glitter to the 'frosting' and the stars. And I used a glitter pen for highlighting...it's REALLY sparkly. 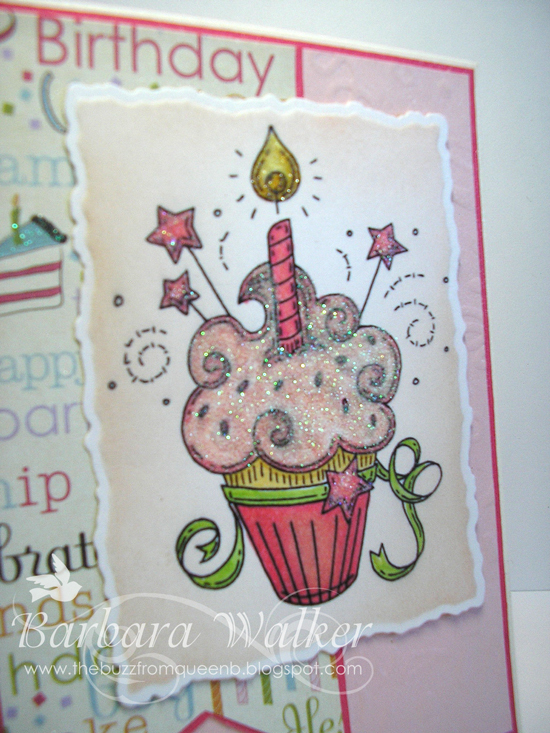 The inside is finished off with a few stamp sets from Stampin' Up! I love their new Sketched Birthday set. That's where the party hat and balloon came from. And I used two of the new In Colors, too...Strawberry Slush and Crisp Cantaloupe. Don't you just love the names SU! comes up with? The new colors are fantastic and they will be making many more appearances in the weeks to come. That's it for me today! Thank you for visiting. 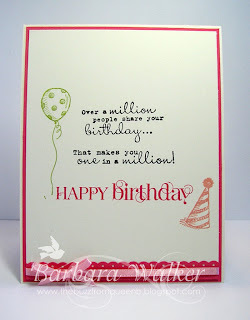 What a fabulous card, Barb! Love all the sparkle. I'm sure Melissa is going to be so thrilled when she receives it. I so enjoy seeing your cards. You add a lot of love to them and it shows. Keep up the great work! 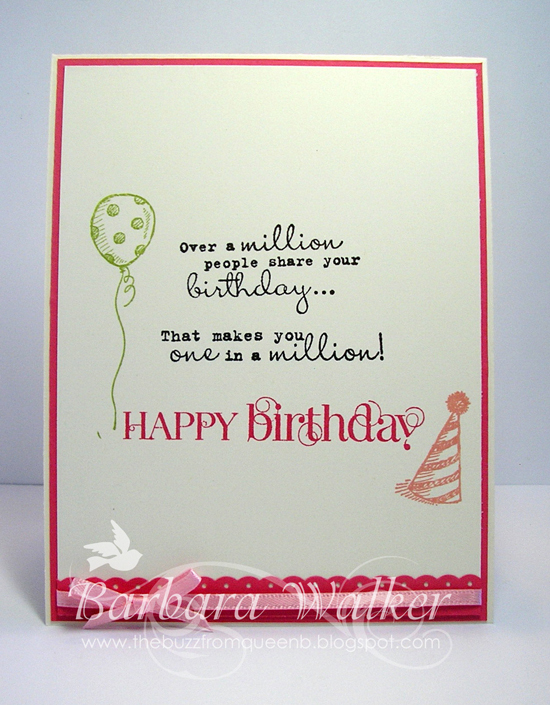 Darling card, Barb! Your cupcakes are the best - love the sparkle!! 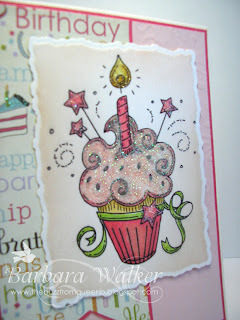 I have been watching your blog for a bit and I love your cards they are so adorable and you are just cute as a button. Thanks for sharing your amazing talent. 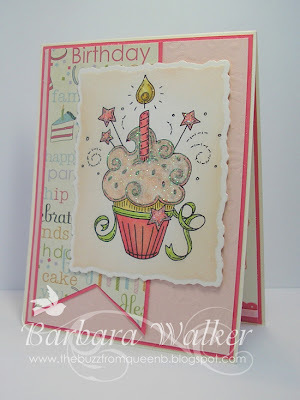 I love the soft color palette you used here, and fabulous sentiment! (Will add that to the shopping list, lol)TFS! Your cards are so amazing. Question for you. When you are using digi stamps what paper do you put in your printer to keep the image from bleeding when you color it?